Its a big stretch to imagine Saddam Hussein and George W. Bush working out their differences in a treehouse now. And its probably too late for Ariel Sharon and Yasser Arafat. But if Bill Allen had his way, talks at Camp David would be quite literally out on a limb. A financial planner for Penn Mutual in South Burlington, Allen isnt afraid to think big: If we had enough money, wed build a treehouse on every corner and everyone would be allowed to go in them and everyone would get along really well, he enthuses. But even this expansive embrace of humanity doesnt include world leaders yet  though a guy can dream. For now, Allen is focusing on a younger and far more receptive audience: kids with disabilities. At the moment, of course, the Camp Ta Kum Ta treehouse sits empty, waiting for next summers rush of excited kids. But the leafless trees of winter allow a better look at it. Across a broad field from the parking lot, you can see right through the woods to the house near the edge of Malletts Bay. A gently sloped 191-foot ramp meanders through the trees and forms a porch along the edge of the treehouse. Once there, the structure is some 11 feet off the ground. The treehouse itself is delightful, rough enough to feel organic and so nicely detailed that even Martha Stewart would have to nod in approval. Designed by John Connell, founder of the Warren design/build school called Yestermorrow, the treehouse is irregularly shaped, sort of a trapezoid 25 feet wide at one end and 16 feet at the other. It is built around five trees  three standing dead ones help with structural support; the other two are growing right through holes in the roof, which is 18 feet at its highest pitch. Twenty-one screened windows all round are protected from rain by a generous overhang. Made from rough-cut, unprocessed hemlock, the house is as environmentally correct as we could make it, Allen notes. Outside, the ramps floorboards are covered with a non-slip surface made from recycled materials; the roof is tin. Next year, the house will get bunk beds and a composting toilet  all accessible, of course. Turning dreams into reality seems to be standard operating procedure for Bill Allen. A board member of the Make A Wish Foundation since it came to Vermont in 1989, he was in charge of fundraising for five years. One of his ideas was the Make A Wish Hockey Classic  an all-star Vermont-versus-New Hampshire game now in its tenth year. Allen has also served on the board of the Boys and Girls Club of Burlington and co-founded Santa Night, an annual one-evening fundraiser that brings low-income families a little holiday cheer. Nearly five months ago, he became a parent, with his partner Lara Heath. But even the joys and demands of first-time fatherhood havent kept his head out of the trees. Allen concedes hes on a mission. And like so many life-changing choices, this one came about serendipitously. After discovering a book on treehouses, he and a friend built one  the conventional kind  in the friends back yard. When his father died shortly thereafter, the emotional passage got Allen thinking about doing something different, something meaningful, he recalls. That desire and treehouses somehow clicked. Allen shared his plan with John Connell, who jumped on board  literally. It appealed to him in a number of ways, explains Allen. The architecture is interesting, its green architecture, the angle for kids. They also got advice from Montpelier arborist Bill DeVos, whom Allen calls almost like a structural engineer for trees, and construction help from Waitsfield builder Bfer Roth. A prototype was built at Yestermorrow in the summer of 2000  oval in shape, its about half the size of the one at Camp Ta Kum Ta. Allen raised money for the latter project with a kind of Habitat for Humanity meets March of Dimes walk-a-thon, he says. Augmented by gifts and grants  including a sizeable one from the Ronald McDonald charities  donated materials and volunteer labor, the camp treehouse was built for around $47,000. Allen estimates the real cost would have been $80,000 to $100,000. Hes negotiating with various communities and groups to build more treehouses in Vermont. Though the feedback has been positive, Allen says, we dont have definite agreement yet. He would love to see treehouses in every state park, for example, and is very interested in Camp Thorpe in Brandon, which also serves kids with disabilities. In fact, Allen would like to see an entire retreat center  a cluster of 10 to 15 treehouses  that would be geared to kids in summer and open to others the rest of the year. spending the night in a tree can be a good thing, he declares. Allens ambitions are not just pie-in-the-sky. One recent newspaper article about his foundation was picked up by the CNN Web site and attracted international interest. Weve been approached by a group in Brazil, he informs. Weve agreed to help with treehouse design, at least, at Candlelight Ranch  a retreat in Austin, Texas, that serves families with handicapped children. 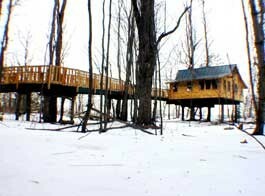 A Rotary Club in Michigan has requested treehouse help as well. One of Forever Youngs board members has elicited interest from Neil Youngs Bridge School  the rocker has two children with cerebral palsy. They also plan to contact Paul Newmans foundation, which funds camps for kids with cancer. For more information about Forever Young Treehouse Foundation, check www.treehousefoundation.org, or write info@treehousefoundation.org.